CMIRC ended January with a social night on the 30th of January at The Dukes at Maya Mall. A number of visitors and potential new club members were in attendance. 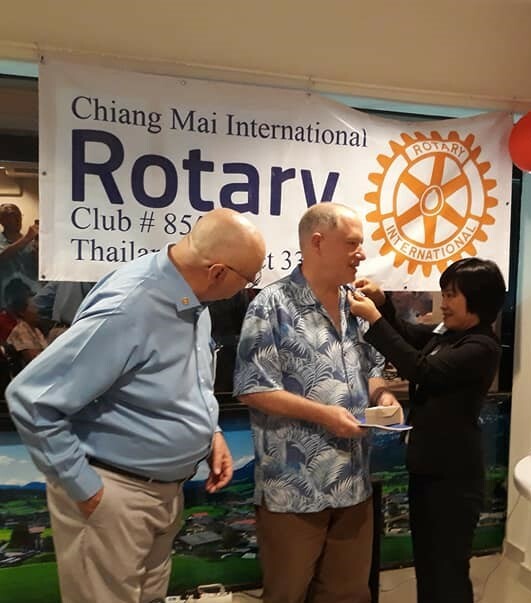 Craig Clark was inducted into our club as our newest member and was pinned by his wife Anne who is a Rotarian in the USA. On the 6th of February the Child Water Safety and Drowning Prevention team met with Rotarian Jimmy from the Rotary Club of Patong Beach. The Patong Beach Club will be conducting a water safety program for ninety-one (91) students. Jimmy had the opportunity to meet with Kru Payu Swim water safety instructors, see the facility at Bronco Kids Sports Club and talk with Khun Pomme about logistics of running the program. On the 6th of February we had a regular meeting of our club. Our guest speaker was David Kennedy, Past District Governor (PDG) of D3700 in Australia. PDG David talked to the club about the importance of The Rotary Foundation. On the 9th of February, Rotarians Nancy and Roger attended the press conference and social event put on by Khun Aom of Earth Wind and Fire, the organizers of the Thailand International Balloon Festival. This is the event our club has partnered with to stage our major fundraiser – The Golf Ball Drop (GBD). 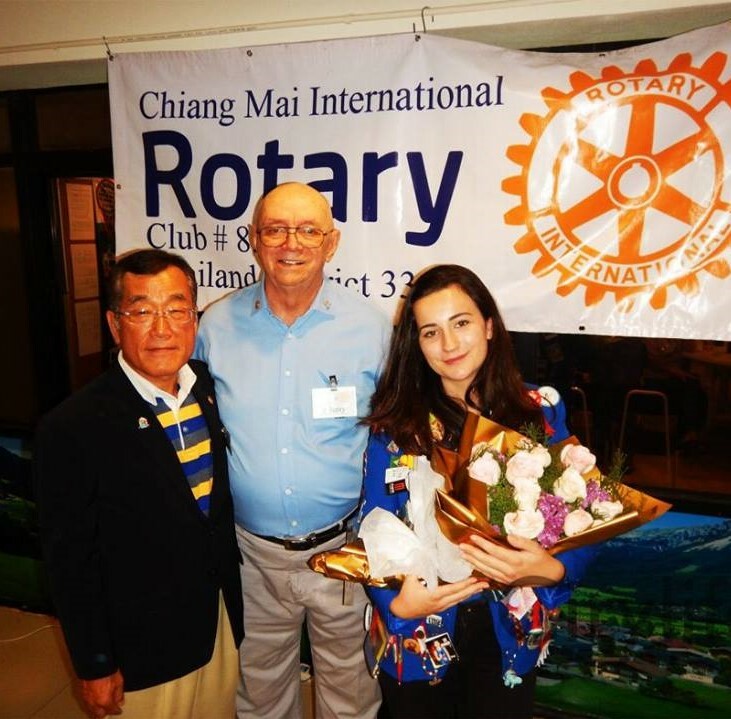 Rotarian Nancy had chance to address the gathering and to discuss our club’s involvement with Khun Aom. On the 12th of February Rotarians Jerry, John, Roger and to-be-inducted Joel Lupro met with the BEAM Educational Foundation (Bridging Educational Access to Migrants). BEAM exist to assist with the unmet needs of Burmese migrant students seeking higher level college preparation courses and advanced vocational skill training. In discussions with Rebekka and Kophyo of BEAM, it appears that our CMIRC English Language Cultural Exchange Club would be helpful in preparing their students for the GED social studies exam. More coming about this in the future under the leadership of Rotarian Linda Pfotenhauer. On the 19th of February, the CMIRC Cultural Exchange Language Club, under the leadership of Linda Pfotenhauer, had a follow-up meeting at BEAM to gain a better understanding of how we can assist in the social science section preparation for their GED program. 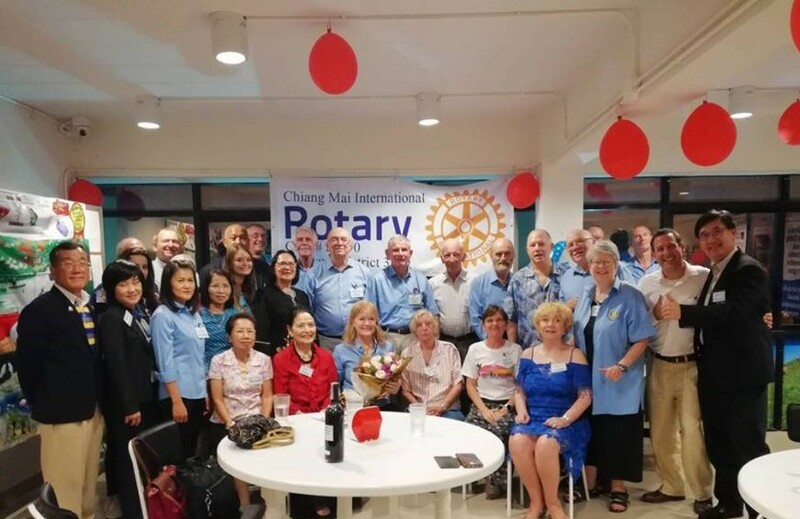 On the 20th of February our club celebrated at Hong Kong Lucky restaurant our fourth birthday as a Rotary Club. The club was chartered by Rotary International on the 21st of February 2014. The Rotary Theme that year: “Engage Rotary, Change Lives”. On the 27th of February, there was CMIRC Board meeting at Hong Kong Lucky restaurant. (Left) New member Joel Lupro is pinned by PDG Suparee at the Feb. 20th club birthday party. (Right) CM North President Tony and other club members came with birthday wishes.